The Air We Breathe - Description | W. W. Norton & Company Ltd. 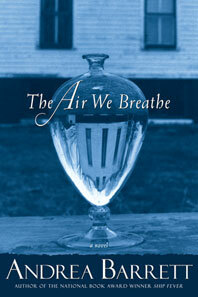 The exquisite, much-anticipated new novel by the author of Ship Fever, winner of the National Book Award. In fall 1916, Americans debate whether to enter the European war. "Preparedness parades" march and headlines report German spies. But in an isolated community in the Adirondacks, the danger is barely felt. At Tamarack Lake the focus is on the sick. Wealthy tubercular patients live in private cure cottages; charity patients, mainly immigrants, fill the large public sanatorium. For all, time stands still. Prisoners of routine and yearning for absent families, the patients, including the newly arrived Leo Marburg, take solace in gossip, rumor, and—sometimes—secret attachments.An enterprising patient initiates a weekly discussion group. When his well-meaning efforts lead instead to a tragic accident and a terrible betrayal, the war comes home, bringing with it a surge of anti-immigrant prejudice and vigilante sentiment. The conjunction of thwarted desires and political tension binds the patients so deeply that, finally, they speak about what's happened in a single voice.The Air We Breathe, though entirely self-contained, extends the web of connected characters begun with Ship Fever. In a splendid display of show-and-tell, 26 writers tell a story and lift the curtain to reveal how they did it.